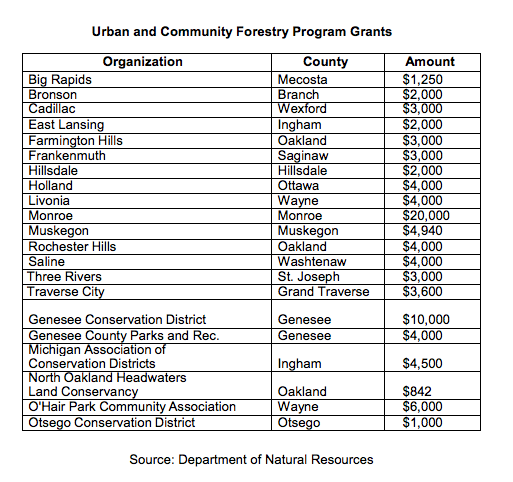 LANSING — The Department of Natural Resources (DNR) has awarded $90,000 to help cities regrow urban forests damaged by the emerald ash borer plague. Twenty-one cities and environmental groups will receive between $800 and $20,000 each to replace trees and fund environmental education programs. Groups in Wayne County received $10,000 to plant trees in Livonia and repair nature trails in Detroit. Among the other recipients are Traverse City, Cadillac, Big Rapids, Holland and Three Rivers. Emerald ash borers have killed 50 million trees in the Great Lakes region during the past 12 years, according to the Department of Agriculture and Rural Development. Natural resources officials say they hope to prevent future tree losses by encouraging communities to plant a diverse crop of trees. One such threat is Asian longhorned beetle, which has been reported in southern Ohio and Northeastern states. The beetles feed on hardwood trees such as maples, Sayers said, which cities planted years ago. The grants require cities to match the amount awarded by the state. Forestry officials in Livonia have planted an estimated 6,500 trees since the emerald ash borer first appeared in 2002, about 1,000 of which were paid for by state grants. This year’s grant will also pay for plantings at a local school, along with several hundred saplings that will be handed out to students there. In Oakland County, Rochester Hills was awarded $4,000 to replant trees along the city’s main boulevards, including maples, oaks, lindens and hybrid elms. The city has planted more than 5,000 trees since it launched its urban forestry program in 1986. “We’ve tried to fill every available spot along our streets where there’s a planting site,” forestry operations manager Gerald Lee said. And in Detroit, the O’Hair Park Community Association was awarded $6,000 for new trail signs throughout 25 acres of public woodlands. Populated mostly by oaks and sycamores, the park has fared well compared to other neighborhoods in the city ravaged by emerald ash borers and Dutch elm disease, said Susan Stellar, a former city forester who now oversees O’Hair Park’s operations. LANSING – Michigan is lagging far behind states on the Atlantic and Pacific coasts in exploring innovative markets and uses for wood products and wood energy, experts say. And with Michigan’s abundant forestlands, identifying and developing new uses has major implications for the economy and employment across the state, not only in the north.